A Shisha Tutorial with a New Foundation! Remember this watermelon gingham embroidery tutorial that I wrote up for Commonthread by DMC and told you about last month? You’ll find my most recent tutorial for shisha embroidery here, on Commonthread. The tutorial covers the basic shisha stitch, which I wrote about a while ago in the Stitch Fun! series, but this new tutorial on Commonthread uses a different series of foundation stitches for the technique. 1. You can choose between a single and a double layer of foundation stitches – for larger shisha, a double layer works great and for smaller, a single layer. 2. This type of foundation works really well over slightly domed shapes with flat backs, which opens up lots of possibilities for attached objects. 3. It’s quick to work and super secure. You could, in fact, just use the foundation stitches and skip the rest, and your mirror or other object will still be securely attached to the fabric. I hope you enjoy my new shisha tutorial over on Commonthread! If you get a chance to play with some stitches this weekend, try it out and let me know what you think! A great tutorial Mary and your instructions are really easy to follow, I do like photo tutorials as you can see the stitches as you write the instructions. 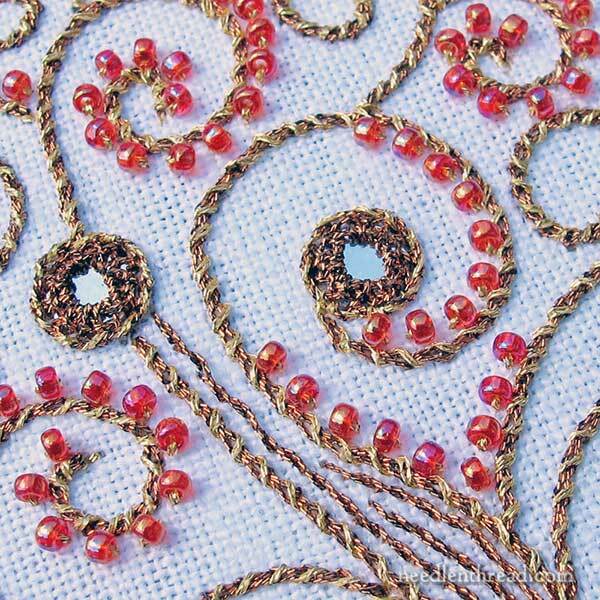 I love the photo of the Shisha embroidery above the beads really complement the gold thread lovely stitching. I going to add Shisha mirrors on my current embroidery I stitching monograms from your ebook and I though small Shisha mirrors look nice so I can’t wait to start on them to see how they look. Thanks for letting us know of your Shisha Tutorial at Commonthread for the tutorial on Shisha embroidery. I hope you have a great weekend. Thanks for your reply. I’ve just finished the F and J and I will send photos as soon as it’s finished. Although my stitching is not as good as yours I can never cage the exact length of each stitch as you do. But it looks OK once I decorate the piece with Shisha it hopefully won’t notice. PS I meant to say on my original post. ‘I thought small Shisha mirrors would look nice’ thats what happens when you rush things. Can’t wait to see it, Anita! Hi Mary, that is a wonderful tutorial over there, and I see the wee, small change to the foundation stitch! I never would have thought of it, but it makes perfect sense to use. Everyone interested in shisha needs to go over there and see. I have made a loose, almost caftan type house dress, and dressed it up with fabric paint and shisha, and it looks very avante garde! LOL not bad for an old(er) housewife! Thanks, Tracy! And congrats on your dress – what a good idea! I really do think the different foundation makes a huge difference in the ease of doing the stitch and how it works out! I’m glad you like it, too! Mary, you are such an inspiration! That tied foundation stitch looks very secure – very reassuring for someone yet to make her first attempts and worrying about the mirror escaping. I’m building a stockpile of old data CDs and really must take the plunge. I love stitching Schisha mirrors and will definitely be trying this idea. Your gold embroidery with the beads is so pretty. Not sure if I have gold thread in my stash but I do have blue glitter thread so I may try to stitch something similar, if my thread is not too thin. PS I have been following you for some time, and find your tutorials so very helpful, however this is my first comment. Hi, Barbara! Thanks for your comment! Glad you enjoy the tutorials! I was a bit thrown off by your shisha article, as I am spending the week in Qatar, and I have seen lots of shisha-smoking here! I think I much prefer your version of sihisha, Mary! Hi… Just to let you know the link to Commonthread doesn’t work any longer… I even tried a search on their site using the word ‘shish’ and it came back with no results. Thanks. Previous Previous post: A New Embroidery Linen’s in Town – Off the Grid, or On!